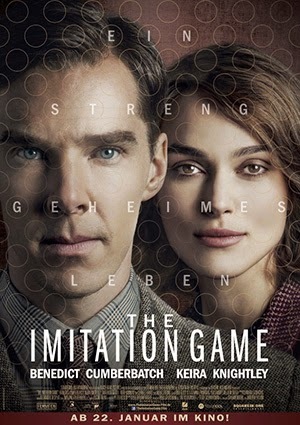 Finally, finally, finally I've seen The Imitation Game. I wanted to see it from the first time I heard about it and that was quite a while ago as I follow nearly every (film related) step Mister Cumberbatch does because he's my favourite actor. And the film got released in August already. But hasn't been out in Germany until last week so I was happy to be able to see it in Berlin last weekend (it's not showed in my town's little cinema). And I was stunned by the beauty of this film. For those who haven't heard about the film yet: It's about Alan Turing who was a Mathematician and a pioneer of computer sciences. He's been a specialist in cryptography and helped the Allies to win the Second World War by decoding the Enigma Code, which was used by the Germans to send messages which couldn't be read by the Allies. The film narrates the story of him and his team and especially focuses on the problems they had doing this amazing work. It also tells Turing's background story as it is disturbing. He's been gay in a time where that was illegal and even though he was a genius and helping his country and the world, they treated him very badly. You can probably tell, that I'm struggling a bit to summarise the film, that's because there's so many little things in it I want to tell, because they got me. It really touched me. But I don't want to tell you everything, because I want you to watch it as well. I think one of the main reason this film is touching is not only the story but the cast. Benedict Cumberbatch's performance is just excellent. You feel with him or better with Turing, you get the sense that you've got tell him everything will be fine, even though it won't. He impersonates this lonely gay obsessive genius that was Alan Turing very brilliantly and convincing. I'd love to see him win this Oscar he's nominated for. But somehow I'm suspecting this won't be the case and Eddie Redmayne will get it for his performance as Stephen Hawking in the Theory of Everything, because he is remarkable in it as well. Speaking of Oscar nominations there's a total of eight, including best picture, best actor in a leading role and actress in a supporting role. Therfore you an tell that it's not just Benedict Cumberbatch's performance, it's the rest of the cast's as well. Especially Keira Knightly's performance is amazing as well. 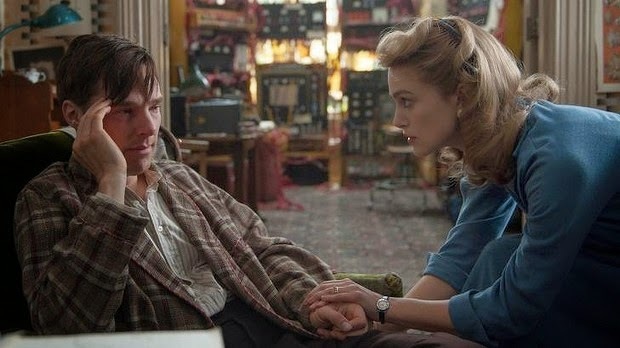 She plays a fascinating and intelligent woman named Joan Clarke who's also on the team to decode Enigma and has some kind of special relationship to Alan Turing. I only wish there was more told about her personal story in the film. I always like to see things about strong women in men's jobs, especially in the past. I know, a bit feminist. And it's a biography of Alan Turing and not her, I know and it's not really a negative remark. All that is exactly why you’ve got to go see this film. The cast is awesome and the story fascinating, touching and based on a real story about a person who has made impact on our lives. He kind of invented the modern computer after all. Love that movie! It's so great. Cumberbatch deserves the Oscar for this one! Incredible acting on his part. It really is and I really hope his work gets even more recognised.